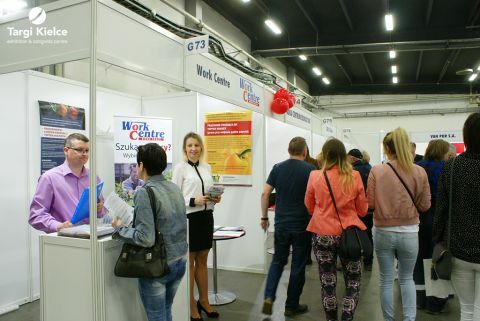 The National Employment Fair held in Kielce is one of Poland's largest event of this kind. Last year’s event hosed 110 expo stands. The exhibitors offered 3,600 job openings in as many as 275 professions. As many as 1,931 called in the expo centre within the three and a half hour time. This year employment fair is held on April 16 from 11:00 to 14:30, venue - the Targi Kielce G Expo hall. The Kielce Employment Fair hosts exhibitors from all over Poland, but not only. On numerous occasions the expo was graced with the presence of embassies’ and companies’ representatives from Austria, Finland, the Netherlands, Canada, Northern Ireland, Germany and Norway. Every year, the trade fair agenda is enhanced to include business-targeted conferences as well as training for job seekers. The Advisory Zone has also proven very popular among the latter. This is where those who look for employment may consult their application documents and talk to specialists about career paths. The 22nd National Employment Fair held in Targi Kielce - welcome!